This ingenious fantasy centers around Milo, a bored ten-year-old who comes home to find a large toy tollbooth sitting in his room. 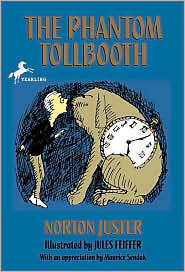 Joining forces with a watchdog named Tock, Milo drives through the tollbooth's gates and begins a memorable journey. He meets such characters as the foolish, yet lovable Humbug, the Mathemagician, and the not-so-wicked Which, Faintly Macabre, who gives Milo the impossible mission of returning two princesses to the Kingdom of Wisdom.